As many of you may know, I am nail polish obsessed and have no less (though probably far more) than seventy-five different polishes in rotation at this very moment; thus, seeing as how it is one of my favorite Twitter days (#ManicureMonday), I thought it would be fun to share with all of you some of my latest lacquer looks! 1) This was created using one of my favorite polishes on the planet – Wet ‘n’ Wild’s Buffy the Violet Slayer. This is three coats, with one coat of Seche Vite Fast Dry Top Coat. Ring via Forever 21. 2) This look was created using Nicole by OPI’s One Big Happy Fame-ily, which is a color from the Spring 2012 Kardashian Kollection – available exclusively at CVS. This is four coats, with one coat of Seche Vite Fast Dry Top Coat for added shine. Rhinestone Heart Ring in Peach / Gold via Forever 21. 3) This was created using another one of my all-time favorites…Essie’s Mint Candy Apple. I used three coats of Mint Candy Apple on all fingers except for the ring finger – there I used three coats of Wet ‘n’ Wild’s Kaleidoscope for a splash of sparkle. One coat of Seche Vite Fast Dry Top Coat was used on all fingers. Arrow Connector Ring via Forever 21. 4) This lacquer look was created using three coats of Sinful Colors Professional Nail Enamel in Pink Forever on all nails, except for the ring finger – there I used three coats of Sinful Colors Pink Glass – again, for extra sparkle. One coat of Seche Vite Fast Dry Top Coat was used on all fingers. Ring via Forever 21. Wow, these are great. I'm going with twisted pink from the Sally Hansen Xtreme wear collection. I love these! I definitely need to put on my NYC Fast-Dry enamel this morning. Such cool colors. I like the darker colors though. I have a dark gray that I really like. 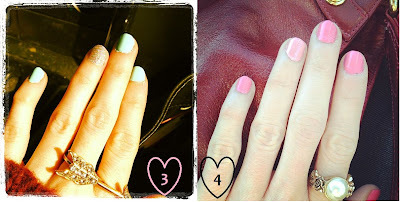 So love your rings in these picks too. i cant shoose a fav.. LOVE them all! Heck, yes, I love nail polish! gorgeous! my favorite would have to be no 3. i love it! and your rings are wonderful! Love the Manicure Monday title! I just did my toes in Sinful's Boom Boom, a fun bright pink. I am adoring the bright colors for nails these days! Need to paint mine! I keep my nails bare for the most part, but a look I really liked wearing was one similar to Britney Spears' mani in her "I Wanna Go" video. I know this is about nails, but can I just say what beautiful hands you have? Gorgeous! I'm just getting used to blue nail polish--it would go with great so many silver/pewter pieces of jewelry . . . Pretty nails Erika! I love how much you enjoy polish! Today I am wearing our new 4FREE Floating Lotus--the exact bright carnation color that was in the new Jil Sander collection! Erika, you're a nail-painting goddess! I love every one of these cute, creative manicures! i am so bad at painting nails- I always let them chip so I rarely have mine painted. But that doesn't stop me from appreciating how great they look! Like I always tell you like a broken record.. i love your polish/ring combos so much. they're all so cute! love number 3! 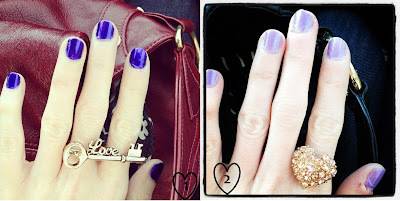 great post, i love them all - and your rings!! Your nails look fantastic. I really like all of the looks, but I'm between either 1 or 2 as to which is my very favorite! I adore #1 & #4. I just got me some new color from Wet and Wild a very cool pink. I hope I like it. I love nail colours as well. I dread to think how many I have. Loving all these colours, and in particular love every single ring you're wearing. I like to paint my nails but hate, hate, hate taking off nail polish. Which generally means that I don't paint my nails very often. Do you have a favorite polish remover? Any secrets for making the removal process easier? Well done nails makes a gal look more polished overall. great post, Erika! I love the third look with the two different polishes. and your love key ring in the first look is awesome. where did you get it? also, i'm currently wearing Kissy by Zoya on my nails. I love the name of the first color (and the show of course!) you always have such a great ring collection! I love the pink nail color! Sooo spring! I especially love the mint. I love seeing what others are wearing on thier nails!